We read a lot here in A Mama’s Corner of the World. I recently had the fun opportunity to join an online book club, From Left to Write. While I do a lot of book reviews, this club asks for something a little different: simply a post inspired by the club’s book of the month. The first book that I’ve read with them is Saturday Night Widows by Becky Aikman. I thought that this book, about a young widow who struggles to find her fit in a traditional support group and begins one of her own, would inspire me to write about young friends who have been unexpectedly widowed—or about my own fears regarding the subject. Instead, it reminded me that it’s okay not to fit in with “the crowd”, to face life as an individual—and it’s also okay to be true to yourself. There is someone for everyone. Remember that old saying? You don’t have to change yourself to fit the group—you need to find a group where you fit in. The author of Saturday Night Widows found herself rejected by a widow’s support group. Instead of changing her views and needs to be accepted by the traditional group—she changed the rules and began a support group that fit her and, subsequently, its members. We can find our group—no matter the need—we just may need to look outside the traditional box—and that’s more than okay. I may not always handle everything the “right” way—but, I handle everything my way. I have never been much of a follower. When I don’t believe in the activities or beliefs of the “group”—I find a new group. I don’t know how I would cope with losing my husband as the author did. I probably wouldn’t be a proper widow either—and this book reminds me that that’s okay. I do not need to live my life as everyone else does—or thinks I should. I need to live my life for me. It’s cute to be different. My middle daughter frequently wears a pajama shirt with this saying plastered across the chest. And it’s true. Best of all, I think my daughter believes that it's true! It is more than okay to be different from “the crowd”—and I hope that she and her sisters always have the confidence to present that sentiment. 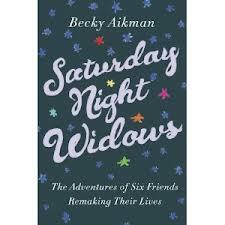 If you would like to read Saturday Night Widows—and see how Becky Aikman inspires you—check out the Saturday Night Widows: The Adventures of Six Friends Remaking Their Lives on Amazon. Handling everything 'my' way...good strategy! Thanks for sharing your thoughts.